John was the temporary leader of The Purple Dragons while Hunwas away serving the Utrom Shredder. His name is never given in the 2003 cartoon; rather, it is the from the first issue of the Dreamwave comic, where a little more background on his character is explored. You’re goin’ down, freaks! Nobody messes with the Purple Dragons! Especially wearin’ stupid turtle costumes! After Leonardo’s inner monologue quip correcting him, the Turtlesproceed to attack the Purple Dragons. 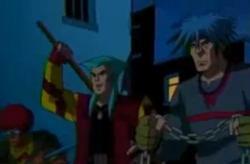 In the actual episode content itself, John leads the Purple Dragons in stealing an armored car and a large amount of money. Raphaelinadvertently gets trapped in the vehicle, prompting the Turtles to chase after them. After catching up to them, the events of the cold open proceed (sans narration), and the Purple Dragons are soundly defeated. Despite pleading for his life (and incorrectly referring to the Turtles as “karate frog creatures”, despite initially identifying their species correctly), he is apparently killed by an irate Oroku Saki. The first issue of Dreamwave Comics’ brief run of TMNT comics, also titled Things Change, shows John and the police officer modeled afterKevin Eastman (here named ‘Frank’), as childhood friends. They were present at the accident that lodged the four baby Turtles and ooze canister into the sewer; John, sporting spiky hair as opposed to his flattop and mullet seen in the present, attempts to reach for the falling Turtles, but misses. He ironically mutters that they’d probably get eaten by a sewer rat. Following this, a Purple Dragon approaches the boys, inviting John to look up the Purple Dragons when he gets a bit older. The rest of the issue proceeds much like the episode version, although John and Frank catch sight of one another and lament the career choices one another has made. During the fight with the Turtles, John pulls a gun out, but is knocked unconscious by Michelangelo’s nunchaku. He drops a scrap upon hitting the ground. At the issue’s conclusion, following John’s death, Frank spots the item John had dropped in the alley – a photo of the two of them as children. John appears in the game Teenage Mutant Ninja Turtles: Battle for the City, as a regular enemy.